In September 2014 Hewlett-Packard announced that it would divide into two companies in order to respond to market demands and to be more “nimble.” Daryl Connor, in his 1998 book Leading at the Edge of Chaos, popularized the term “nimble” describing nimble organizations as those with “a sustained ability to quickly and effectively respond to the demands of change while delivering high performance.” In today’s technological world, being nimble may be even more important than it was when Connor first used the term. Being nimble means managing change before it happens. Can public organizations be nimble? Rules, regulations, laws and customs seem to mitigate against that. Government is seen as being rule-bound, risk-averse and change-averse. While those factors mean that public agencies may never be as nimble as private organizations, there are at least 10 things public managers can do to be nimble leaders and to create more nimble organizations. Nimble leaders recognize the “eye of the storm” – that time, the calm before the storm and before total chaos, when major change first surfaces. It is at that time when people are most able to adapt and to innovate. A change in political leadership or in policy is usually preceded by the “eye” – the calm before the storm, the implementation of the change. Nimble leaders can help employees prepare for this expected storm. For example, a legislative change meant that a social service agency was faced with the possibility of its services being privatized. The manager led the staff through an exercise in identifying what a new provider would have to know and do. As a result, staff felt less stress and were more confident – and, ultimately were able to compete with private vendors and secure the service contract. Nimble leaders “control the slide” – like Indy racers, they know just how much speed to apply as they enter change (the corner) to maintain momentum and to slow down just enough when necessary to re-establish control. The “honeymoon” for a newly-appointed manager is an opportunity to control the slide, to introduce enough change to change direction but not so much as to send the organization off its track. Nimble leaders create goals and performance measures that recognize and reward nimbleness—for example, discovering a new way to meet regulatory requirements while also encouraging client participation. Nimbleness also is reflected in leaders’ personal goals that specifically seek and encourage change. They “walk the walk,” setting expectations for themselves that reflect what they expect of others. This might be a new skill, a new professional activity or a new collaboration. Nimble leaders anticipate the need for adaptability by hiring more resilient employees, preparing current employees for continuous change and creating job assignments and performance management systems that address change role proficiency. They constantly push for higher performance yet recognize that failure is to be expected with innovation. HR managers know that each new hire and each promotion is an opportunity to change the organization and, with foresight, to encourage nimbleness in individuals and their units. Nimble leaders do specific things to create and encourage a culture of change. Organizational conditions, as much as employee performance, are critical in supporting nimbleness. Leaders institute and encourage rituals and activities that celebrate change and innovators. Protocols, paperwork and performance reviews can reflect the organization’s emphasis on agility. The tried-but-true practice of “managing-by-walking-around” is an opportunity to visit employees’ workplaces, listen to them and emphasize their importance in the changing organization. 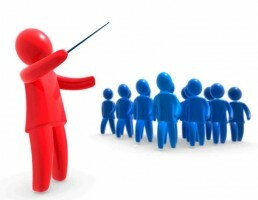 Nimble leaders help others to focus on and understand the forces affecting the organization. In that sense, they are teachers or reporters. They talk about and model the cognitive, psychological and social behaviors necessary for dealing with high speed change. They also reflect confidence that the organization can respond to those changes. They are cheerleaders in the broadest sense of the word – celebrating past successes and encouraging employees to continue to find ways to be effective and enthusiastic. Nimble leaders balance short-term objectives and long-term goals. Public managers work in an environment that is inherently short-term (i.e., the next election) but do not lose sight of the bigger picture and longer-term goals. While responding to the public’s demands for greater traffic control, for example, a nimble police chief will also ensure that officers are receiving training and experience in working with new immigrant populations. Nimble leaders manage change, identifying specific activities and ensuring documentation of actions, outcomes and intended or unintended effects. They create systems to combat being rule-bound and to overcome vested interests, ingrained mental models and sacred cows. Communication happens continuously and in many different ways. Nimble leaders do not rely on a crisis to force change. Crisis in and of itself is not a powerful impetus for long-term change. If it were, cardiac events would cause heart patients to alter their lifestyles appropriately. Fear does not create change. More often, fear leads to denial and creates a narrative that reframes facts to fit preconceived ideas of what the organization is, what it does and what is expected of employees. Instead, nimble public managers proactively take specific actions so that their agencies can respond quickly and effectively to the demands of change.